Making iPhone apps isn't easy. ith nine-year olds writing applications for Apple's iPhone, one might be led to believe that programming for the device was child's play. Alas, for every successful garage developer, there's a major production house that tries its hand at app writing and fails miserably. While Bioware has rightly made a name for itself over the years producing role-playing epics for the PC and Xbox, their first foray onto the iPhone is a bit of a mess. Sure, Mass Effect Galaxy was probably intended to be more advertisement than game, but that doesn't excuse this application's many faults. NPC interactions are a definite highlight.Mass Effect Galaxy takes place between the events of the first game and the sequel which is due out next year. 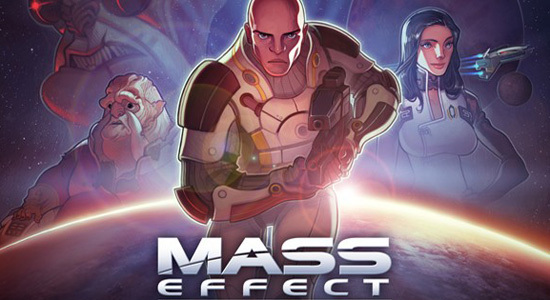 Players take control of Jacob Taylor, one of the cast members of the upcoming Mass Effect 2. When confronted with an alien plot to attack the Citadel council, this former soldier must use all the firepower at his disposal to get to the bottom of things. Galaxy's graphical stylings are quite the departure from the Xbox/PC Mass Effect offerings. Highly stylized cartoon renderings replace the photorealism of the original game. This isn't a gripe, just an observation — the lush imagery looks spectacular on the iPhone's screen, standing out as one of the best looking apps I've seen to date. It's in terms of gameplay where Galaxy comes up short. The iPhone's tilt sensitivity is perfectly capable of controlling a simpler shooter like iFighter, but it's not up to the task of navigating the hallways and corridors of this sci-fi action game. The end result is that Jacob behaves more like a drunken sailor than a space marine, bouncing off walls and obstacles as he struggles to navigate his environment. The firing of weapons is an entirely automatic affair — tap an enemy to lock on, and Jacob will fire away with all he's got. All this basically boils down to a mediocre (and unfulfilling) game of dodge 'em: swerve wildly to avoid enemy fire and let Jacob's endless stream of bullets do the rest. The addition of special biotic and tech attacks do little to enhance gameplay — whether you use these powers or not, success always hinges on your ability to dodge enemy fire. Separating each mindless action segment is Galaxy's narrative, an interactive comic of sorts that could have stood on its own as an outstanding marketing tool and diversion. Like in the original Mass Effect, you respond to other character's via a number of preset emotional responses. The story unfolds based in part on your choices — had Bioware merely exploited this mechanic rather than tack on the drab action experience outlined above, we'd be looking at a far better application. Diehard fans looking for some insight into the upcoming Mass Effect sequel may want to check out Galaxy — $3 probably isn't too much to pay for some backstory and exclusive access to preview movies and information. Everyone else, take note: while paying for an advertisement is never wise, paying for a lackluster advertisement is nearly criminal. Sorry Bioware — better luck next time.